At Bishop’s Orchards they work hard and take pride in growing the highest quality fruits to enjoy year after year. Apples are readily available from late August to late October. 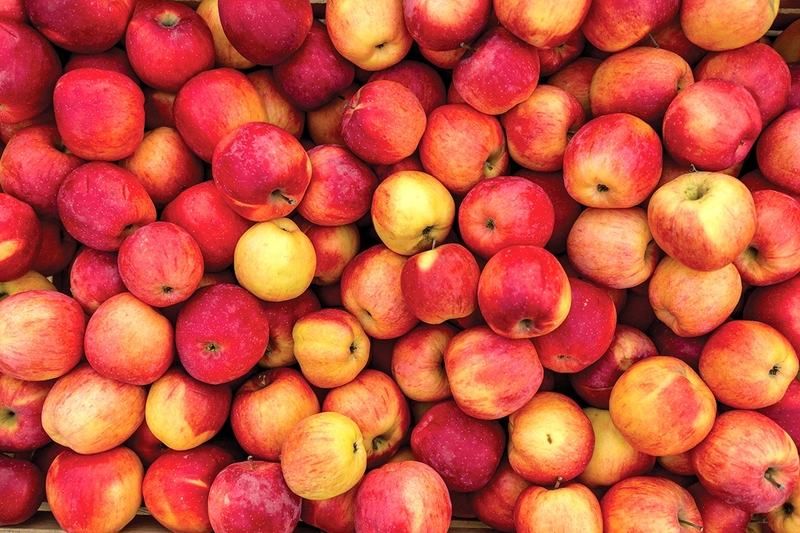 On site, there are over 20 varieties of apples for cooking, gifts, or a quick snack on-the-go. The orchard provides bags at no cost and on the weekends a tractor trailer rides will take you from the parking area into the orchard. Not to mention the family fun that comes along with walking through this orchard’s seasonal corn maze. After four generations, this family farm still thrives with tried and true methods for raising the freshest produce around. While times and technology have changed, Buell's Orchard offers fresh apple picking is from Labor Day through October for those homemade apple pies, apple crisps, or even just a sweet midnight crunch. The pumpkin patch is a great place to visit to make the most of your Halloween carvings. Get lost on over 7 acres in the corn maze! Take a hayride, visit with farm animals, or pick a pumpkin from the patch. This farm is the perfect place to take your family to get out of the house, enjoy the fall breeze, and of course some famous creamy and fresh, buttonwood ice cream after the long maze. Adventure never stops here with the cow train, duck races, and straw bale mountain. Take a scenic walk to the picking areas, enjoy a weekend wagon ride, or just relax in the shady area with picnic tables for your enjoyment. Drazen Farm truly has a place for any age to enjoy the farm and sweet fruits that come with it. With 14 different kinds of apples to choose from, whether you like the sweet crunch of red delicious, or the sour kick in granny smiths, there is a flavor for everyone! Bring your own scissors to pick fresh lavender at Fort Hill, known for its 300 varieties grown organically in six gardens. Be sure to sample the farm’s own lavender ice cream! Fall is the perfect time to check out the farm’s annual Corn Maze Adventure, which combines agricultural education with outdoor fun. Pick your own pumpkin, then head over to the on-site creamery for fresh milk. With over 33 acres, the orchard produces over twenty varieties of apples, peaches, pears, plums, and nectarines for picking, eating, baking, and enjoying. In addition to seasonal pick your own, the country store provides all of their homegrown produce, gourds, jams, honeys, locally baked apple cider donuts, gourmet foods, seasonal decorative items, and more. Taste the combination of 40 years of experience, love, and passion for farming in every bite. The Holmberg Orchards excellence in fruit production is no secret due to this family's commitment to the farm dating back to the 1960s. While the size, shape, and variety of apple trees and fruit crops are constantly changing with modern farming techniques, Holmberg Orchards’ commitment to grow "the finest fruit for the finest customers" continues. With both apples and pumpkins to pick in the fall, along with the irresistible aroma of baked goods in their farm market baked daily, this orchard guarantees the traditional farm picking experience for your family. Overlooking the Connecticut River, the Lyme Orchard offers a fantastic view for your family to put their farmer hat on and pick a number of varieties of fruits from June through October. This family owned farm grows eco-friendly apples and peaches with organic weed and pest control. From all different kinds of berries, to apples and pumpkins, whether you buy them in the Apple Barrel or pick your own in the orchards, you are getting apples and peaches that are grown in ways that respect the Earth. Norton Brothers Fruit Farm is to come and pick fruit, relax at the picnic tables or on the grass, shop in their farm stand, watch the bees make honey, or just enjoy Mother Nature. With 19 different kinds of apples to pick, hayrides, a pumpkin patch, and scarecrows, your family is bound to get in that fall spirit. Scott’s Orchards in Deep River is full of all sorts of fresh and juicy delights for your family to pick. With strawberries, blueberries, raspberries, plums, pears, peaches, nectarines and apples, along with a variety of tomatoes including heirloom, a variety of squash, yellow and zucchini, many varieties of peppers, sweet and hot, wax beans, green beans, shell beans, lima beans, cucumbers, pickling cukes, eggplant, sweet corn, basil, thyme, mint, muskmelon, and watermelon, there is ample flavor to choose. Let’s not forget about the great pumpkins to pick during the October season. This farming operation consists of 125 acres of fruits and vegetables. At Scott’s Yankee Farmer, your visit is not complete without an apple in one hand, and a fresh apple cider donut in the other! Enjoy seasons treats and a wagon ride with your family at this close-to-home, beautiful farm. Visit their roadside stand, pick your own produce, or participate in their Community Supported Agriculture (CSA) program and enjoy locally grown goods all season. An apple a day really does keep the doctor away! West Green Farm Orchard and Dairy is committed to helping others observe a healthy lifestyle. The farm offers in-season fruit, berries, vegetables, flowers, herbs, and bedding plants, grown in rich topsoil. Visit their website to read up on raw milk and the benefits of nutrient-dense foods.